Never a dull moment, is it? The work week began with the Moon in regal Leo, an apt placement for a bright spot in the daily newsfeed. And here I would be referring to the royal baby born yesterday to the Duke and Duchess of Cambridge. Today the Leo Moon goes void at 2:39 PM ET, not to enter Virgo until 4:40 PM ET. Chill for a couple of hours and refrain from making mountains out of molehills. Roll with whatever twists and flakes may disrupt your efforts to move forward in a straight line. Then use the Virgo Moon’s discerning needs to sort out and put in order whatever you have on your plate for the next few days. Pluto, which turned retrograde on Sunday at 11:23 AM ET — at 21 degrees of Capricorn. Retrograde planets suggest a time to look inward for authority in whatever matters ruled by that planet. Pluto is power, control, regeneration, transformation, healing. So stop trying to control the world around you, already. Work on controlling (mastering) your own inner world — and then the world around you will start to reflect your newly-masterful self. Y’know? You’ll feel the potential for a change of perspective more personally if you have a planet or angle around 21 degrees of Aries, Libra, Cancer — and especially Capricorn. Mars and Jupiter are in harmony today, exact at 1:13 AM ET. This is an excellent transit for an easy flow of physical activity, including childbirth. Venus leaves comfy Taurus for multi-tasking Gemini TODAY at 12:40 PM ET. Here, Venus — which refers to women, money, social expression and aesthetics — will seek to be ever-so entertaining as it seduces you with potential double talk until May 20th. If you have planets or angles in Gemini, Virgo, Sagittarius or Pisces, your social stock may get a boost over the next few weeks. Consult your local astrologer for details. On WEDNESDAY, Mercury and Saturn will square off for the third time in recent weeks. We’ll see this reflected in somber and serious thoughts and communication — perhaps even cutting or depressing. Mercury refers to how we need to think; Saturn refers to control and patriarchy. On THURSDAY, Mars and Pluto will meet up — exact at 6:54 AM ET. Already we’re seeing the explosive potential of this pairing in the headlines. Ten pedestrians in Toronto were killed yesterday when a young man plowed a van onto a crowded sidewalk. Over the weekend, another young man armed with an assault rifle opened fire in a Tennessee Waffle House. This story has one of the positive potentials of Mars with Pluto: courage — on the part of James Shaw, the African-American young man who tackled the shooter, saving countless lives. And let’s not forget that the Iran nuclear deal is pulling major focus this week, as John Oliver explained in the latest episode of Last Week Tonight. Meanwhile in North Korea, a bus crash kills 32 Chinese tourists…and talk of nukes is once again on the table. Oh, and oil is up again. Also on THURSDAY: the Virgo Moon will be void between 5:49 AM ETMarsand 9:13 PM ET. If you are unfamiliar with the potential suggested when the Moon is void, here’s a primer. FRIDAY and SATURDAY may be rattled by the Moon’s weekly clash with disruptive Pluto and Uranus, exact on Saturday at 11:18 AM ET and SUNDAY at 1:32 AM ET. Emotions will already be building to a crest, release in the wake of SUNDAY’s Full Moon, which by then will have entered Scorpio. And you were expecting a light spring week? Take heart! There’s a new royal baby in town! What do all these patterns mean to you? Check in with your local astrologer once or twice a year, just as you would with your dentist. Our consultation is sure to be validating and empowering. Here’s how to contact me. I neglected to mention the death of Barbara Bush. I should have, given last week’s heavy influence of Venus (women) in touch with Jupiter (grand, big, expansive) and Pluto (power). Add to that the disruptive potential of the Aries Sun with rebel Uranus. Kudos to WaPo op-ed columnist Ruth Marcus for noticing the synchronicity in the headlines in her column “What a week for women. Barbara Bush would have been proud.” That op-ed included Senator Tammy Duckworth — the first Senator to give birth in office and bring her infant daughter to the Senate floor, breaking a Senate taboo. I would add Madeleine Albright to this mix. Check out her new book: Fascism: A Warning. At WaPo, the most-viewed story is “NRA are blowing up Yeti Coolers.” In third place: “I thought I was done”: George H.W. Bush faced death at 20 in WWII.” Mr. Bush was hospitalized yesterday. 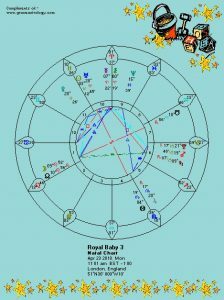 Finally, here is the horoscope for Royal Baby #3. Sun in Taurus, driven by that regal love-love-me-do Leo Moon. This is a strong will with a dramatic and fiercely independent temperament. It’s fronted by a Cancer Ascendant, suggesting a need to be seen as someone who is caring and sensitive. 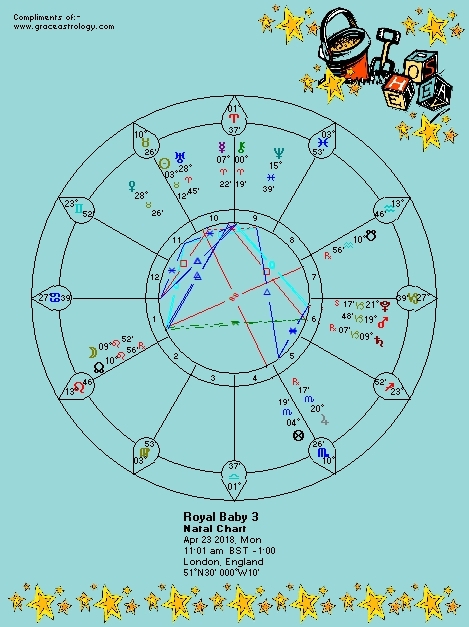 It’s no surprise to see his Midheaven at the Aries Point, suggesting prominence in public status (!). There’s a strong need for an expression of physical stamina and potential excellence in athletics. For now, let’s leave him be to adjust to his new life on Planet Earth. It’s fascinating, however, to study the horoscopes of children. If you’re ever looking for the perfect baby shower, Mother’s Day or Father’s Day gift, a consultation about a child’s horoscope is priceless.